Okay. I know I photograph my Bird Girl statue far too much. But I'm having fun watching her "weather," despite my friends and family who don't understand why I don't just buy some spray paint and "fix" her. One of my favorites is this one, titled "Crimson Splendor." 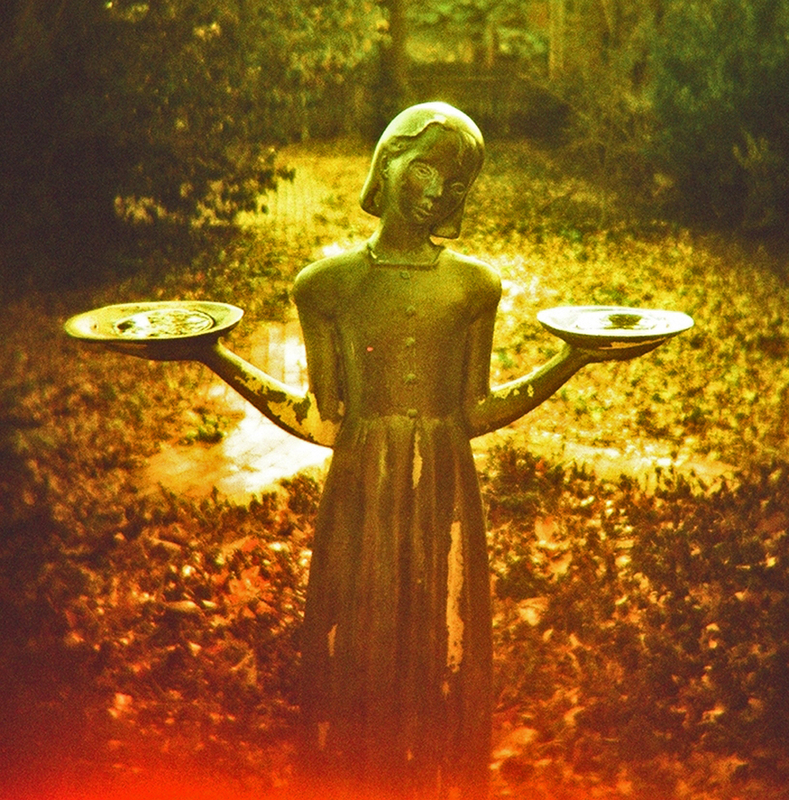 It was shot with Holga with X-poed slide film. I shot six in a row, and each is different. This one is the best. I've submitted it to several of those toy camera exhibitions, and each time it was declined. Always a bridesmaid, eh? When I heard about the Lenscratch "My Backyard" exhibition, I immediately thought of this image. There are five online pages of other backyard shots. Bird Girl is somewhere in the middle of part five. You may gaze at her here, or look at her on the website. Plus, check out the other entries. There's some good stuff on there. From the exhibition: "Happy Summer!! Summer marks time in our backyards: getting out the grill, entertaining, and relaxing in the garden. It's a time to reconnect with the natural world and celebrate sun dappled skin, an ocean breeze, and that glorious afternoon light."